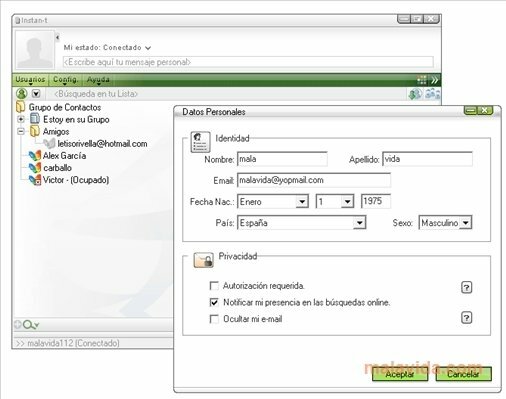 Instan-t Messenger is a program with which you can connect to several instant messaging services, with the objective of being able to communicate with as many contacts you want simultaneously, without any need to have several clients open, nor having to start each one of the accounts each time that you need to speak with somebody. 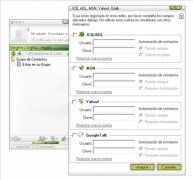 The application is compatible with MSN/Live Messenger, AOL, ICQ, Yahoo! Messenger And Google Talk, as well as with the programs own instant messenger service. 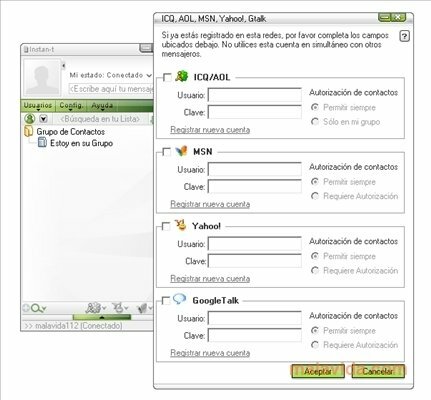 The graphic interface is similar to that of the vast majority of chat clients, with the only difference that the windows and the menus have plenty of color. 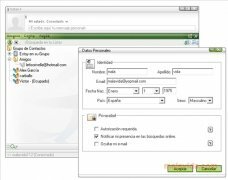 Your contacts will appear in the main window of the program with a representative icon for the service that they use, so that recognizing each and everyone on your friends or family will be as simple as possible. The program allows us to use emoticons, save the conversations that you maintain with any of your contacts and, what's more, communicate by means of a video conference, by using your webcam. Discover a simple stable multi-protocol messenger client that is full of opportunities, thanks to Instan-t Messenger.